Heading into Canada’s final selection camp for the 1994 World Junior Championships, the headlines were dominated by who wasn’t in camp more than who was. Canada was missing as many as 10 of their top players who were playing in the National Hockey League or the Canadian Olympic Team, including Chris Gratton, Chris Pronger, Jason Arnott, Alexander Daigle and Paul Kariya, all of whom, with the exception of Arnott, played a key role in Canada’s gold medal win the year before in Sweden. With a lack of star talent, no one expected the no-name Canadian squad to repeat as World Junior champions. Tully was one of nine OHL players who made the team, including forwards Jason Allison (London Knights), Curtis Bowen (Ottawa 67’s), Brandon Convery (Niagara Falls Thunder), Aaron Gavey (Sault Ste. Marie Greyhounds), Todd Harvey (Detroit Jr. Red Wings and Mike Peca (Ottawa 67’s), along with defencemen Drew Bannister (Sault Ste. 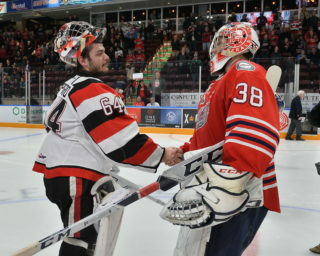 Marie Greyhounds) and Nick Stajduhar (London Knights) and goaltender Jamie Storr (Owen Sound Platers). Canada wasn’t the only team affected by the loss of key players. The addition of more Europeans playing the NHL, combined with the Europa Cup being played in Germany at the same time, left Sweden and Russia short-staffed for the tournament as well. The Czech Republic, competing in the tournament for the first time as an independent nation, were at as one of the favourites to capture the gold on home ice. Canada opened the tournament against Switzerland, who took an early lead in the game with a goal 1:59 into the first period. Harvey tied the game midway through the opening period and Stajduhar’s powerplay marker gave Canada the lead. Peca also scored to help Canada to a 5-1 win. Canada killed off 14 powerplays, including four different occasions where they were short by two men. The Canadians complained that every time they touched a Swiss player they were penalized, including three times in a 37 second span during the third period. They scored three times on 12 powerplays. Canada surrendered the first goal again the following day against Germany, but their powerplay helped them to a 5-2 win. Peca, who was leading the OHL scoring race before he left for the World Junior camp, was used to quarterback the powerplay from the point. He had a goal and two assists with the man-advantage through the first two games. Canada’s motto for the tournament was “Day by day, we get a little stronger.” Even thought their first two games were against the weaker teams in the tournament, the wins gave Canada some much-needed confidence after coming into the tournament without many of their top guns. Their next game was against Russia, who would be looking for revenge after the embarrassing 9-1 loss Canada handed them the previous year. The Russians were led offensively by Alexander Kharlamov, the son of the late-Russian hero Valeri Kharlamov, who led Russia in the 1972 Summit Series against Canada. The junior Kharlamov scored twice to help Russia to a 5-1 win over the Czechs on the opening day of the tournament. Harvey gave the Canadians the lead in the first period, converting a pass from Stajduhar on one of Canada’s four powerplays in the opening frame. Anson Carter put Canada up by two with 5:32 remaining in the second period and Allison gave them a three goal lead with a powerplay goal at 5:14 of the third. Canada’s confidence was sky-high and they poured shot after shot on Russian goaltender Evgeni Riabchikov, who kept the Russians in the game with several key saves, including a breakaway stop on Carter. Sergei Brylin put Russia on the board with 7:40 remaining in the game before Tully took a boarding penalty with 2:25 left on the clock. Kharlamov scored 12 seconds later with Riabchikov on the bench to pull the Russians to within one goal. Canada was losing confidence and the Russians took advantage. When they arrived in the Czech Republic, the Canadians were warned of the high crime rate in the area. Storr’s father had his jacket stolen while eating at a restaurant and assistant coach Danny Flynn (Sault Ste. Marie Greyhounds) woke up in the night to find an intruder in his hotel room. Flynn hollered and scared the culprit away. Canadian equipment manager Peter Herd slept in the team dressing room for the rest of the tournament to make sure nothing was stolen. The next day against Finland, star forward Saku Koivu tied the game at two with an unassisted marker in the second period. Rick Gerard (Swift Current – WHL) scored a pair of goals in the third period to pace Canada to a 6-3 win. 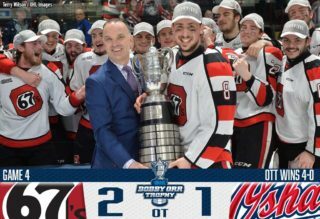 Manny Fernandez (Laval – QMJHL) made 40 saves in his tournament debut. After blowing a three-goal lead against Russia, the win helped restore the confidence in the Canadian dressing room. After an off day, Canada found themselves down 2-1 to the U.S.A. midway through the first period on New Year’s Day. 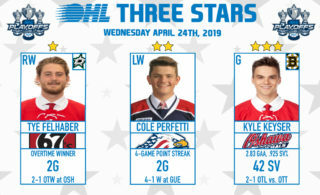 The Americans had nine players that played in the Canadian Hockey League, including OHL’ers Jason Bonsignore (Niagara Falls Thunder), Jamie Langenbrunner (Peterborough Petes), Aaron Ellis (Detroit Jr. Red Wings) and Richard Park (Belleville Bulls). Canada scored three times on less than a minute to take a 4-2 lead after one period. Peca, Allison, Harvey and Gavey all scored in an 8-3 win, leaving Canada (4-0-1) and Sweden (5-0-0) as the only undefeated teams in the tournament. The Czechs, a pre-tournament favourite to win on home ice, were disappointed with their 2-3-0 record. They jumped out to an early lead, scoring 2:30 into the first period. Convery evened the score nearly three minutes later and the Canadians added a powerplay marker for a one-goal lead after one period, despite being outshot 17-6. The Czechs regained the lead with a pair of goals to open the second period before Allison set up a pair of goals 2:14 apart to put Canada ahead. Gavey scored the game-winner at 7:49 of the third to give Canada a 6-4 win that set up a gold medal showdown with Sweden on the last day of the tournament. Sweden won all six of their games and outscored the opposition 31-10. A win or tie against Canada would give them their first gold medal since 1981. Forward Niklas Sundstrom was the top scorer with four goals and 11 points and was named the top forward in the tournament. Harvey had four goals and seven points and was one of Canada’s emotional leaders on and off the ice. Allison and Yanick Dube (Laval – QMJHL) combined for Canada’s first two goals before Sweden responded with a pair, including the tying goal with 27 seconds left in the first period. 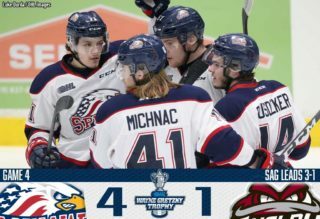 Canada scored three unanswered goals in the second period, including two by Martin Gendron (Hull – QMJHL), the second coming with 13 seconds left in the period. Sweden scored twice in the first half of the third period to pull to within one goal. In the final seconds of the game on a Sweden powerplay, Mats Lindgren, who had two goals in the game, had the puck at the side of the net with Storr caught out of position. Before he had a chance to put it in the open net, Gavey pulled the puck off of the Swede’s stick and fired it down the ice. Gerard clinched the game with an empty-netter with six seconds remaining to give Canada a 6-4 win. Storr earned the win and finished the tournament with a 3-0-1 record and 2.50 goals against average and was named the tournament’s top goaltender. “My heart was thumping harder than it’s ever done before,” said Harvey of the final minutes of the game. “I was actually biting my fingernails when I was on the bench. That’s how nervous I was. Canada was the World Junior champions for the second straight year and the fourth tim in the past five years.